Caribbean Airlines faces an uphill climb now that is has solidified plans to re-enter the trans-Atlantic long-haul market in June from its Port of Spain, Trinidad hub to London Gatwick International airport. Service from the Caribbean to Europe by airlines based in the islands has traditionally underperformed, as the complexity of operating a small fleet of widebody aircraft helped to stifle profitability. But Caribbean, now the largest carrier in the region, seems convinced it is necessary to give the trans-Atlantic market a second try. Both Caribbean and Air Jamaica, which was acquired by Caribbean in 2010, have tried in the past to sustain long-haul service to the UK. Caribbean’s predecessor BWIA sold its London Heathrow slots to British Airways (BA) and started codesharing with BA in 2007 on flights from London to Port of Spain. Air Jamaica sold its London Heathrow slots to Virgin Atlantic in 2007 and also began codesharing on the UK-based carrier’s flights from Gatwick to Kingston and Montego Bay. 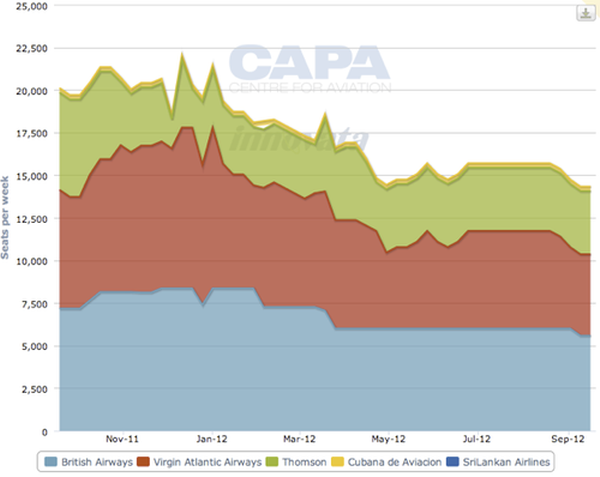 Caribbean aimed to seize an opportunity presented by Virgin Atlantic when its Kingston-Gatwick flights end later in Apr-2012. For more than a year Caribbean has floated the possibility of relaunching Air Jamaica’s flights to the UK, with Caribbean emphasising that Heathrow was the preferred airport for the service. Air Jamaica and Caribbean still operate under separate brands. But gaining slots at Heathrow is difficult for any carrier, and Caribbean likely lacked the financial wherewithal to secure access to the airport. Now Caribbean has shifted the focus away from Jamaica altogether in favour of service from its base of operations in Trinidad. The carrier aims to launch four weekly flights on 14-Jun-2012 with a Boeing 767-300ER, and starting later in the summer thrice weekly flights will be operated by Caribbean from Trinidad to Gatwick with a stop in Barbados. It is not clear how extensively Caribbean has studied Air Jamaica’s long-haul flights from Kingston to London that were dropped in 2007 after losses on the route in 2006 reached USD27 million and were projected to exceed USD30 million for the following year. At the time Air Jamaica said codesharing with Virgin Atlantic on its flights from London to Jamaica would allow it to achieve a net positive result in the market. Caribbean faces similar obstacles that Air Jamaica encountered on its long-haul flights to London including creeping fuel costs and the operation of a small widebody fleet that increases both complexity and expense without offering scale and high utilisation rates. Air Jamaica admitted the two widebodies it operated on its long-haul service to London helped to weaken its overall financial performance. Although 777s were bantered about in the local Caribbean press, Caribbean Airlines is reportedly leasing two 767-300ERs from South American operator LAN to operate the new flights to London in a two-class configuration. Caribbean has its own experience operating long-haul flights from Trinidad to London through its predecessor BWIA, which sold its Heathrow slots to British Airways in 2006 and forged a codeshare with BA on its flights to Trinidad from London Gatwick. The codeshare between the two carriers officially ended in 2010. Now Caribbean will face some competition from its former codeshare partner on the new flights to the UK. British Airways currently operates six weekly flights from London to Trinidad through St Lucia and flies to Tobago through Antigua once per week. All of BA’s flights are operated with 777 aircraft. Virgin Atlantic operates one weekly roundtrip flight from Gatwick to Tobago and a second roundtrip flight that stops in Grenada. Once all seven of Caribbean’s planned flights are launched, a significant amount of capacity will be introduced between Trinidad and London in a short period of time, up to 1547 seats in one direction, which is about 26% of the total 6005 one-way seats BA is offering from London to the Caribbean from April through the beginning of September. Caribbean could lure some passengers that prefer a direct flight, but achieving breakeven load factors on the Trinidad-Gatwick pairing will be challenging. Caribbean also appears to believe there is enough feed into its Trinidad hub to support the level of capacity it is introducing in the London-Trinidad market, but it still seems evident that working with a codeshare partner that feeds into Trinidad would be more prudent, as Air Jamaica learned just five years ago when it opted to forge its codeshare with Virgin Atlantic. It would be much less risky for Caribbean to codeshare on long-haul flights with an established carrier with high brand recognition in the UK, where most traffic would originate, rather than incur the substantial start-up expenses that include foreign distribution and sales, flight crew training and adding another fleet type to its operations. The carrier operates 12 737-800s, four ATR turboprops and three Dash 8 300s. Caribbean is introducing the ATR into its fleet and has seven more of the aircraft scheduled for delivery. Even as Caribbean faces significant challenges in operating long-haul flights to London, its home country of Trinidad and Tobago benefits from having one of the strongest economies in the Caribbean and Latin America, driven largely by oil and natural gas. According to the CIA World Factbook, the oil and gas industries account for 40% of Trinidad and Tobago’s GDP and comprise 80% of exports, which means there is stronger business demand from Trinidad than Jamaica, which may have driven Caribbean’s decision to relaunch flights from Trinidad instead of Kingston. But British Airways likely has a lock on the base of lucrative business travellers that are firmly entrenched in its loyalty programme. Tourism is not as an important economic driver for Trinidad and Tobago as it is for other Caribbean countries, and stopover tourist arrivals declined from 2007 to 2009. In recent years violent crime in Trinidad and Tobago has been increasing, and the British Government has warned that some of its citizens were victims of muggings and robberies in 2009-2010. Stopover arrivals from Britain fell by almost 36% from 2007 to 2009. The increasing crime could dampen the growth of tourism and deter leisure travellers from visiting Trinidad and Tobago. The Government of Trinidad and Tobago estimates that business traveller arrivals to only Trinidad grew 7.7% from 2007 to 2008, while leisure travellers increased by 26%. Caribbean is also launching its flights to London as the UK’s Air Passenger Duty (APD) is set to rise by 8% starting this month. The tax has long been controversial in the Caribbean, with regional leaders arguing it is discriminatory against the region and damages tourism to the area. Under the scheme on which the tax is based, passengers from the Caribbean pay higher taxes than customers travelling from the US since the passenger duty tax is calculated based on the distance from London to a country’s capital city. That results in travellers from California paying less than Caribbean passengers. A flight from London to the US capital of Washington, DC is about six hours, but is nearly 16 hours from London to San Diego. That compares with a roughly 10-hour flight between London and Kingston, but passengers travelling from Jamaica end up paying a higher tax. Under the increases that took effect from 01-Apr-2012, a family of four travelling in economy class between the UK and the Caribbean would pay a total of USD477 for the APD. The increase could dampen some of the visiting friends and relatives traffic Caribbean was aiming to capture on its service to London. Leisure traffic represented the bulk of stopover travellers in Trinidad and Tobago in 2009, the last year of available data, but some of that is skewed by Tobago attracting a larger share of leisure passengers (see Background information). The business case for launching flights from Trinidad to London Gatwick appears weak as Caribbean has previously stated that Heathrow was its preferred airport and a significant amount of capacity is being introduced quickly. But perhaps Caribbean feels that as the somewhat default flag carrier of the region, it needs to make its brand known worldwide at any price.